That is the foundational belief behind Destination Healing retreats, founded and ran by Michelle Tambaoan of La Mesa, Peggy Hamerly of Poway, and Deane Vallejo of southern San Diego. The retreats are three days long and seek to offer refreshment, renewal and restoration for all areas of life. Stretch and nourish your physical body with yoga and healthy meals. Nurture your soul with therapeutic workshops and deep conversation. Invest in your spiritual health with mindfulness and prayer. “Our heart is for women to experience breakthrough,” Vallejo said. All three founders have had their own stories of breakthrough and healing, and each is eager to bring her skill set to the table. “With the gifts we have, we want to pour into the (women),” Vallejo explained. It started with Tambaoan, a self-care specialist working through Revive Spa in La Mesa. She offers her clients both skin care services and relationship healing therapy. Tambaoan is a firm believer in connecting mind, body and spirit — taking care of her clients from the inside out. It was through one of those skin care sessions, actually, that Tambaoan first connected with Hamerly. They had met at a “Moms Helping Moms” group, and Hamerly decided to drive all the way from Poway to La Mesa to receive a facial. But what she really got was a new mission. Tambaoan had the vision of a destination retreat, but was having difficulty working out the logistics. Hamerly is a health coach with a background of 42 years in teaching French and English as a Second Language. She dived into coaching after losing 60 pounds for health reasons and discovering a new outlook on life. Hamerly provides nutritional counseling and is the chef for the weekends. Both the founders and attendees noted her food is both beautiful and delicious! “My life mission, with and through His strength, is to bring spiritual, emotional and physical freedom through a guided stretch along with scripture and prayer,” she described. That’s how each morning of the retreat starts: with an optional (at the retreats, it’s always your choice how you want to spend your time) stretching session. The sessions are often accompanied with affirmations, healing words, essential oils, and meditation. Incorporating the whole body, mind and soul is a running theme throughout the weekend. There are opportunities for nature walks, spa services, and time for reflection. 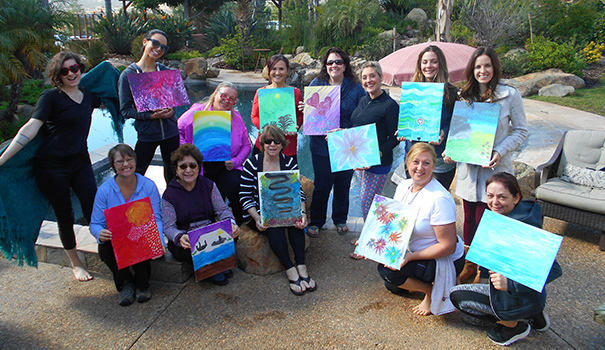 Each retreat also includes an art or craft project designed to explore your heart. Destination Healing groups have done vision boards, flower plaques, and even a “Healer Fine Art Therapy” workshop that required a lot of tissues as the women went deep. Attendees can also go deep through one-on-one sessions with the founders. Again, it’s the attendee’s choice to sign up for who they would really like to work with and where they would like to spend their time. “Those are really powerful times,” Hamerly said of the individual counseling. Meal times are full of colorful foods designed to bring life to the body, served family style. Conversation is encouraged throughout the retreat. “There is a really good sense of community — everyone’s open,” Tracy Duhs said. Duhs is the owner of Sanctuary Wellness Experience. That sense of community and creating a safe space is very important to the founders. They set the stage and provide the tools, but expect the healing to come from the women themselves. “A lot of breakthrough comes in the women talking,” Vallejo said. Because aside from everyone being female, the attendees comprise an eclectic group of backgrounds and interests. Mothers, grandmothers, business women, singles, married, seniors, millennials, from North County to Ocean Beach, they are all invited to come. And come back. The next Destination Healing retreat is on the theme of “gratitude.” It will be held Oct. 20-22 in Palomar Mountain. For more information or to register, call 858-472-3798, email dhretreat@gmail.com, or visit destinationhealing.strikingly.com. —Freelance writer Joyell Nevins can be reached at joellc@gmail.com. You can also follow her blog Small World, Big God at swbgblog.wordpress.com.